High vacuum operation. One-bar/two-bar quench cooling. 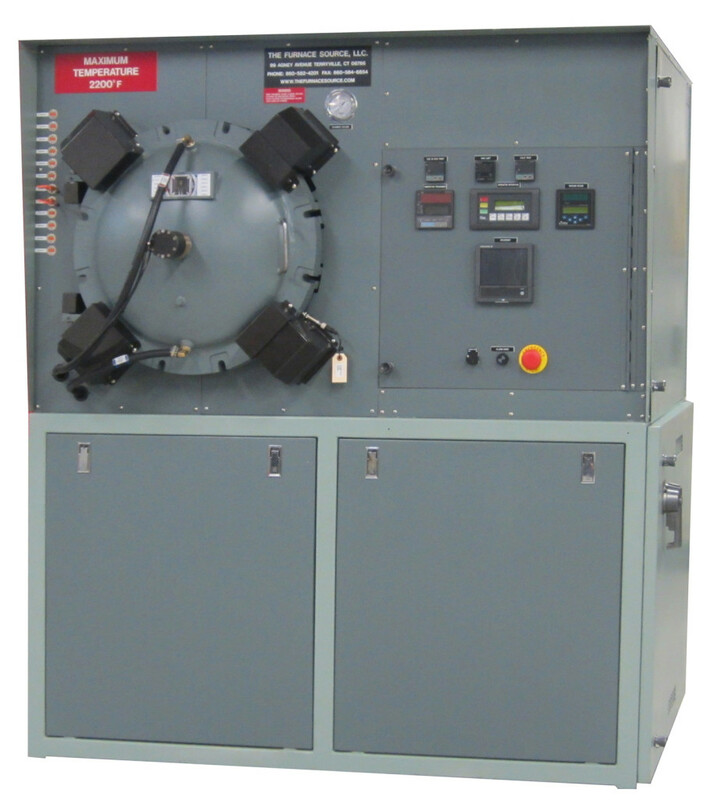 This is a totally packaged and assembled unit that is shipped as one piece, requiring only the water, gas, and power to be connected to the appropriate locations. 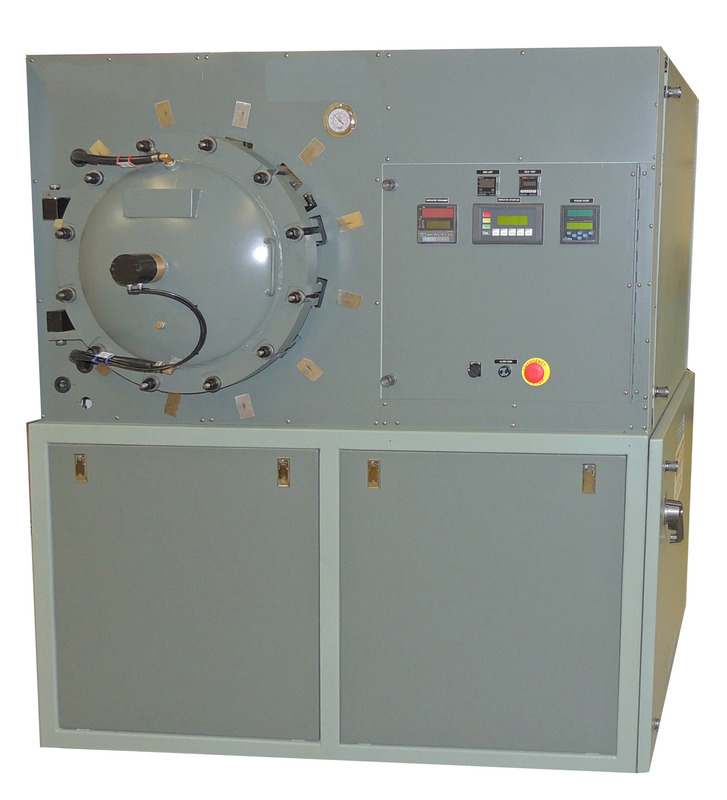 This furnace meets AMS 2750E Class 5 uniformity specifications. Graphite blanket hot zone with carbon/carbon face. Yokogawa UP550 digital programmable temperature controller with 30 programs and 300 segments. Digital high limit temperature controller. Mechanical vacuum pump with holding pump. 6” high-speed diffusion pump (15 cm). Optional liquid nitrogen cold trap. Includes one day of test fire and training at our facility. Liquid nitrogen cold trap to improve and speed up high vacuum pumping. Includes cold trap, control solenoid valve, and digital temperature controller to minimize liquid nitrogen consumption. Pneumatic front door clamps. We will provide (4) pneumatic-actuated, cam over locking door clamps in lieu of the individual, manually-tightened bolts on the front door. These cam over locking door clamps will ensure that the door is properly closed and held closed throughout the process, even if electrical power or pneumatic air is lost. These clamps will be tied to the PLC so that the furnace will not start unless all (4) clamps are closed and locked. Includes the mounting of the door clamps, the necessary modifications to the chamber and the front panel, and the necessary mechanical safety guarding. Touchscreen Yokogawa DXAdvanced R4 (DX1006T). Meets all AMS 2750E requirements. 6-channel paperless datalogging chart recorder with digital communications. Includes easy message, batch, and electronic signature text entry. With ability to apply thermocouple correction values. Network compatible – can appear as a node on a network, making remote data gathering fast and easy. Includes built-in memory card for storage. Remote diagnostics via a modem. Enables us to remotely aid in troubleshooting the furnace and guide your maintenance people directly.